The S&P 500 cooled down a bit during June eeking out a small increase of 0.09%. Since the majority of my net worth is tied to the performance of the markets my net worth moves in line with the markets. Although the dividends I receive help to boost my returns and my net worth increased more than the markets so that's a small win in my book. Of course a record setting month of dividends can do that as I pulled in over $900 in dividends across all of my accounts during June. For the month our net worth increased $4,746.05. I'm still amazed at the improvement in our net worth so far this year considering everything that's changed, mainly getting laid off at the end of April. Our net worth has climbed higher by almost $70k through the first 6 months of this year thanks to a rising stock market and some unexpected severance pay and the back overtime pay that was paid out earlier this year. Sadly I don't expect this trend to continue as we're drawing down our cash reserves some until my wife's paycheck kicks in sometime in October or November. For the month our net worth increased 1.0% and year to date it's just 16.9%. As of the end of June we have 23.5% equity in our house based on our purchase price from 2013. According to Zillow our house has increased just over $15k in value from our purchase price which is a nice bonus, although I'm keeping the purchase price as the value in the net worth equations. Based on Zillow's estimate the equity in our house is 28.5% thanks to the appreciation. 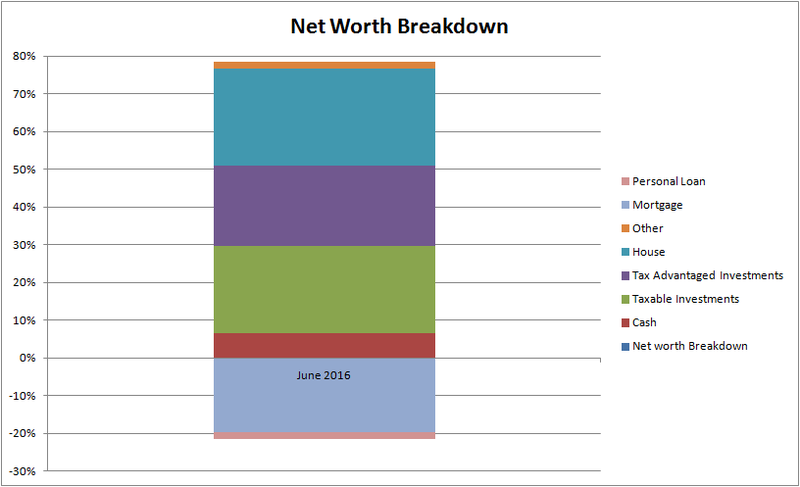 I've also been receiving lots of questions about the breakdown of our net worth. So I'm adding a graph that shows our net worth broken down by category as well as the percentage of our net worth that accounts for. The assets are broken down into cash, taxable investments, tax advantaged investments (401k, Traditional & Roth IRAs), house (using our purchase price) and other which covers things like our cars and various collectibles from when I was a kid. The liabilities are much easier and fall into either the mortgage or a personal loan that we have. Truly passive income, dividends and interest, totaled to $877.27 during June which is about a $50 increase from March's total of $824.98. *The dividends are from my taxable accounts only. Adding in the gross income earned from blogging/writing added another $71.77 to the monthly non-day job income total. That's a total of $949.04 of income that's not related to a regular 9-5 job. We've still got a long ways to go to reach our goal of financial independence, but we're heading in the right direction. 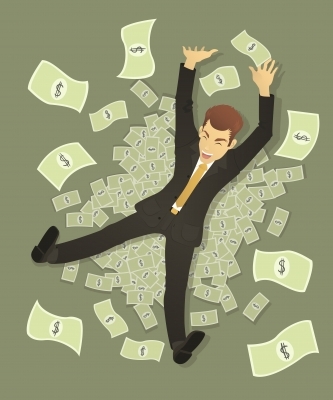 How did your net worth fare in June? Way to go JC! That's awesome, and I'm very glad you aren't paying extra towards your mortgage. Let the BANK HAVE THE RISK..not you and your own money. :) I could talk for hours about why that's the perspective we should have when owning real estate. Keep it up! Eventually we'll start paying down more on the mortgage because it drastically reduces the capital needed to spin off the dividends. But for now I prefer to keep that money for myself. Gogogogogogo! I know you will get there. These posts are fun. I already passed the finish line and I kind of miss the chase. This lets me relive that. Also, I am not a robot. Congrats on crossing the finish line. That's awesome stuff. I prefer to look at my cash flow comparisons, but net worth is still fun to track. It's amazing when I think back to how much progress we've made in just a few short years. Hard to be mad about a $4,000+ net worth increase considering what you have been dealing with. It's exciting seeing the stock market increase the way it has, but I can't help but simultaneously be a little sad about how much more expensive it has made stocks across the board valuation wise. Keep on, keepin' on! Definitely nothing wrong with a $4k increase especially since we didn't have much in the form of income for the month. So that's exciting. Although like you I know we'll be giving back some of these net worth gains because the market likely won't keep these valuations up. Very impressive JC. It is always nice to keep these metrics around, for me it is s motivator as I see that total number increase. Keep up the good work and thanks for sharing! Cash flow tells you more about you financial independence level, but net worth tells you how you got there. It's like with analyzing companies I start with the cash flow statement, but you can be sure that I check the balance sheet as well. Each one gives you a different piece of the picture.